It was really clear that for Dub’s second birthday it needed to be all about trains. So off we went – chugga, chugga choo choo! Dub was about to be two! 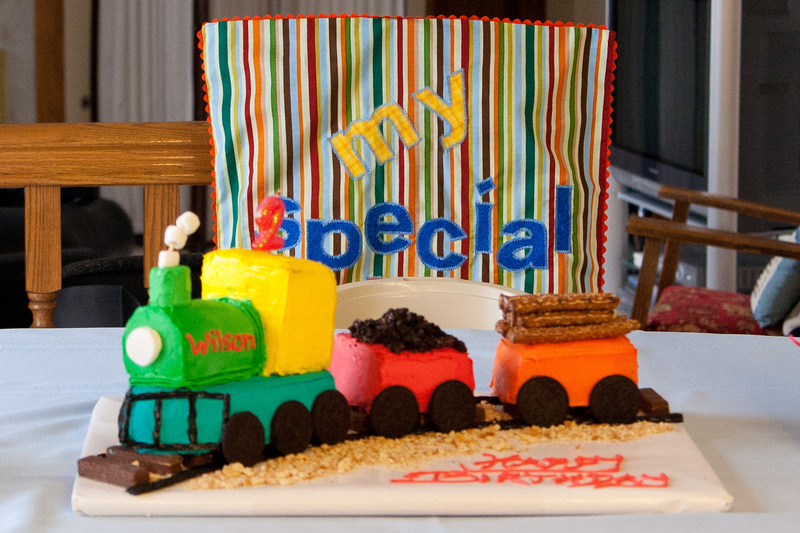 I searched the internet for train birthday cakes I thought I could pull off. I didn’t find anything especially helpful in terms of tutorials, so I had to eyeball it using carved pound cake (slightly frozen works best) and various garnishments to make it look like a train. We used my favorite almond-flavored pound cake from Tastefully simple since we’re not otherwise big pound cake fans. Frosting this sucker was the worst part – I found the cake to be crumbly, even when slightly frozen, so we had to cake the frosting on to disguise them. Notice the chair cover in the background. I had my mother make covers like this for each of our kids to use on special days: birthdays, first days of school and other celebrations. 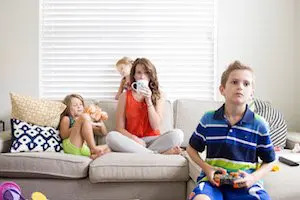 Since all of our family lives out of state, this travels with us for out-of-town celebrations, and the kids know that when they wake up and see this on their chair in the morning – that we’ll be celebrating them that day. It’s become such a fun tradition for all of us!